Young was a carpenter in Mendon, New York, near the church Joseph Smith had established. 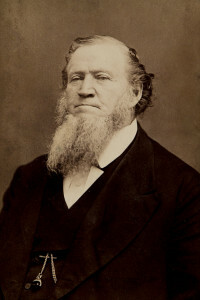 Young read the newly published Book of Mormon and, on April 14, 1832, was baptized into the Church of Jesus Christ of Latter-day Saints, soon becoming a church leader. On July 24, 1847, three years after Smith was assassinated in the Mormon town of Nauvoo, Illinois, Young, now in command of the church, arrived with 148 Mormons—143 men, 3 women, and 2 children—in Salt Lake City, Utah Territory, which he had chosen as the new seat of the faith. This was the vanguard of the great Mormon Trek, a mass Mormon migration, which would ensure the survival of the Mormon religion and open a vast western territory of the United States.